Marriott's VP of global brand marketing said the brand is "not trying to be BuzzFeed." BETHESDA, MD: When Arne Sorenson became Marriott’s CEO in 2012, he shifted the brand strategy to target next-gen travelers. A year later, the hotel giant created a website built for millennials, TravelBrilliantly.com, and now Marriott is evolving that site into a digital magazine of the same name. "Travel Brilliantly is something that millennials may not think of instinctively" when thinking about Marriott, said Michael Dail, VP of global brand marketing for Marriott Hotels at Marriott International. "The whole mission of the brand is around our guests being innovative, creative, out-of-the-box thinkers. Our role is to help them on their journey." The site will feature long-form quarterly content that aims to give readers insight on travel through an editorial lens. "We’re not trying to be BuzzFeed; we’re not trying to always-be-on social content providers," said Dail. "We want to have a purpose and some thought leadership that’s appropriate for the brand." 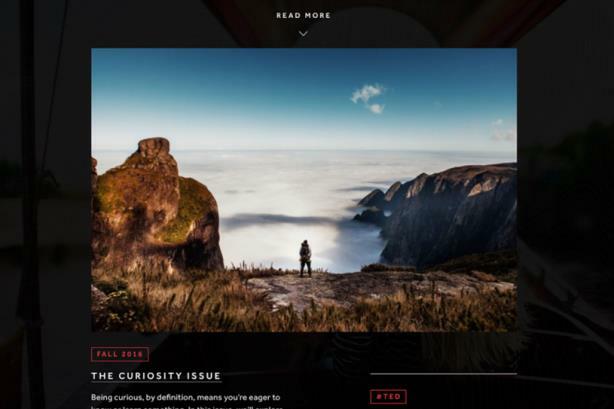 In its inaugural edition, dubbed "The Curiosity Issue," readers will find interviews with Humans of New York photographer Brandon Stanton and astrophysicist Neil deGrasse Tyson, as well as partner content from TED, art/tech company VSCO, and female entrepreneurial firm Create & Cultivate. The brand partners will also host the content on their sites. "This speaks to the creative class," said Jonathan Cohen, VP of strategy and insights at Critical Mass. Tasked with creating a platform that would represent Marriott as a travel brand, not just a hotel chain, Critical Mass began by researching the content produced by the competition and found that there was much room for improvement. "Because we live in the digital age, everyone feels obligated to be always on and pumping out content," he said. "Finding good, quality content was sometimes tough. Just the din of noise of travel-oriented content was extraordinary." Travel Brilliantly originally began as a vehicle to showcase consumer-generated brand ideas, such as integrating local mixology scenes in hotel bars. The new site features a curated collection of thought pieces from partners like TED and influencer interviews. A sister site, Traveler, is made up of general interest stories from partners such as Mic.com. Dail said Traveler and Travel Brilliantly will co-exist in an "organic relationship," as the newly launched magazine consists of long-form content and Traveler focuses on quick tips like the best bike routes in Barcelona.